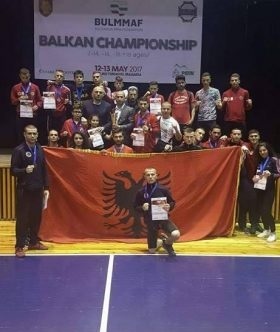 At the end of Balkans Championship of Mixed Martian Arts, which took place on May 12-14, 2017 in Veliko Ternovo, Bulgaria, thanks to the dignified appearance of athletes Albania achieved excellent results by being ranked in second place. In support of the athletes who took part in this activity, was also the Ambassador of Albania in Sofia (Bulgaria), Mr. Qirjako Kureta. Together with his staff gave an added bonus to the contestants. For Albania and the federation this is a historic achievement. This is the first activity that Albania participated with a total of 22 athletes, 20 men and two women.